On a day that saw its stock take a hit, Yahoo! 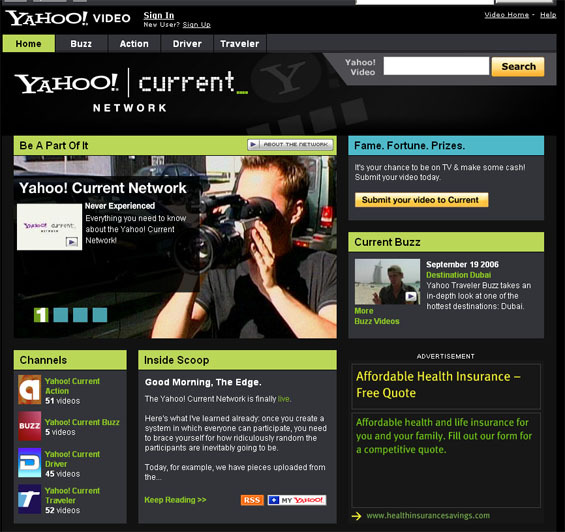 has teamed up with Current TV to launch Yahoo! Current Network, a video site with a mix of professional and user submitted videos arranged in channels. Current TV is a cable and satellite channel backed by environmentalist Al Gore that shows short user-submitted shows and segments in what it called ‘viewer created content’. Yahoo! has been granted the rights to exclusive Current TV content for its video portal, and in return some of the best user submissions to Yahoo! may make it onto the terrestrial Current TV channel. Current TV have previously made a little-known deal with Google to release Google Current, which was a similar concept though hosted on the Current TV site and servers (what they got from the relationship with the search giant is unclear, other than splashing the companies name throughout the videos). Back at Yahoo! there are now four channels of Current content (these names are going to get confusing very quickly) – Yahoo! Current Action, Yahoo! Current Buzz, Yahoo! Current Driver and Yahoo! Current Traveler. We will leave the descriptions of what each of these channels are as an exercise for the reader. Some of the content is actually pretty good, much better than what you would find on YouTube or other amateur clearing houses. As an example, this video gives you not only a decent intro to what Yahoo! current is all about, but is a short clip from Bono and ‘The Edge’ from U2. If you are a U2 fan, you might appreciate the clip of Bono walking into The Edge’s room and waking him up in the morning (the unreleased directors cut has Bono follow him into the shower) and discovering that Yoga is actually a product of Wales. With the popularity of YouTube and the launch of similar video services from every other company, this is a good effort from Yahoo! to raise the quality of video posts and perhaps appeal to a broader audience. Yahoo! video is actually a good service, the videos are of good quality and there is a lot of solid functionality. Yahoo! now has some good video content to give it’s service a bit of a nudge, but this is a highly competitive space so expect more professional video content from everybody over the coming few months.